I think I am finished with an ASCD Arias book on debunking myths around technology in education. After four drafts, I can only hope. I’ve realized a few things through this writing process, digital or otherwise. This is a very unscientific ratio. I’m basing it on the above image, in which I capture the previous four print drafts of my book for ASCD. 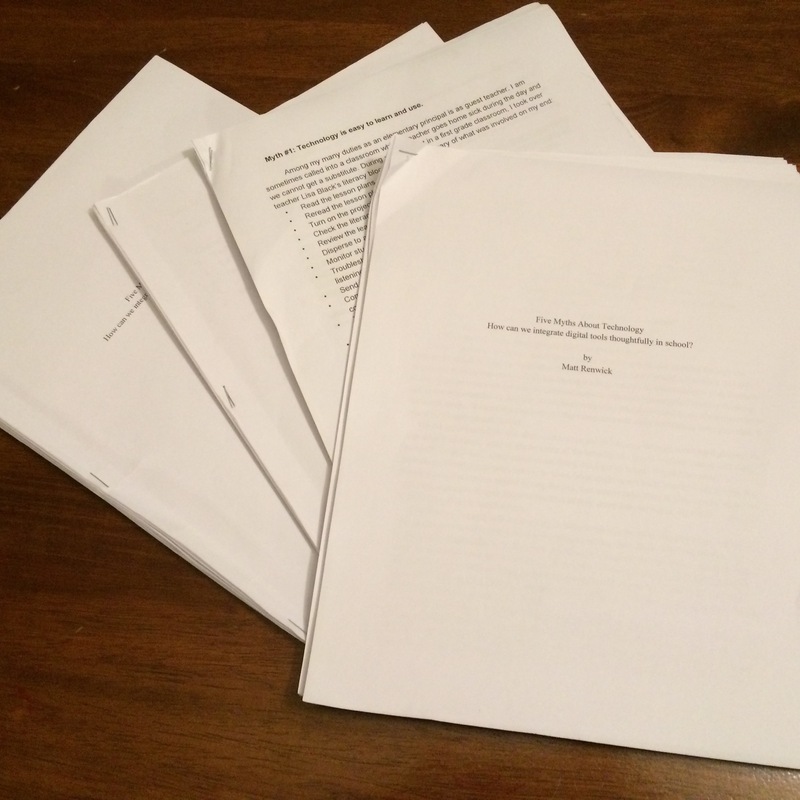 It is humbling to think that a manuscript no larger than 10,000 words (roughly 50 pages in paperback) could demand such energy and time to complete. My writing always had room for improvement, and it was largely in the message rather than the mechanics. As teachers, when is the last time we’ve expected the same? To be fair, the stakes would need to be a lot higher for students than a grade, or even a spot on the bulletin board of excellence. At the same time, with digital publishing, there is no reason this cannot be a reality. Drafting something for a wider audience to read is special. Whether it be online or in print is largely irrelevant, at least in the mind of the reader. You are giving of yourself to an unknown audience. It’s a personal decision. I believe we reveal much about ourselves through the written word. This is what makes writing both exhilarating and scary at the same time. Remember that when you ask a student to publish a fantastic piece that they may appear to be a little reluctant to share with the world. Writing online, such as on a blog, seems to circumvent this issue, although it may subdue truly honest prose. Publishers have a very good method of ensuring that the author produces enough content to work with in the final draft. It’s called a “word limit”. For this book, I was constrained to 10,000 words. 11,500 words later, I am hoping ASCD will reconsider their rules. When we are really passionate about a topic and feel like we have something profound to say about it, there is no word limit that will keep a writer in check. When assigning written work to students, we may want to reconsider our own limits we impose and consider how well they encourage students to write enthusiastically about a subject in which they have immense interest. Revisions they have to make will be out of love instead of compliance. Please share your own writing truths in the comments! So true Tammy and Clare. Doing one more round (hopefully) of light edits, then it’s off to the press. Thanks for commenting. Next Next post: Can Mobile Technology Help Us Be More Mindful?